Does it matter where we buy books? The obvious answer is YES! But the reality is… and I bet you can relate… we slip up on our values and shop online from ‘you know where’. It’s an honest reflect on whether we, the Durland Alternatives Library, can make it work to shop local instead of supporting the richest and most powerful tech company in the world. So when it comes to living our values as the Alternatives Library, and honoring the 43 year history of this organization… does it matter where we buy books? Make it work to offer free coffee and tea to anyone who comes into the library. Make it work to pay a living wage to our team. Make it work to host a community celebration with AMAZING food from a local catering company, and offer this meal to everyone who shows up. Make it work to serve thousands of people incarcerated in the U.S. prison system. Right now we are getting hundreds of letters a week that need to be handled by our library staff. Make it work to run a public library that does not receiving public library grant funding. Did you know we’re our own independent non profit? But can we do this with where we buy books? Ultimately, if we want to live our values, we need to be optimistic. We need to believe that there is always a way to make it work. What are you doing to live by your values, even if it’s not always easiest? Please respond and let me know. I’m compiling all the responses for an upcoming blog post. Tomorrow I’m bringing a microphone into Buffalo Street Books and Autumn Leaves to talk to them directly about how we can make it work to partner with local book stores and officially come clean about where the library is getting books. I’m going to confess that I’ve been shopping from ‘you know where’ for the library and figure out a way to keep it local going forward. P.S. You got your invitation to our upcoming dinner on November 29th right? 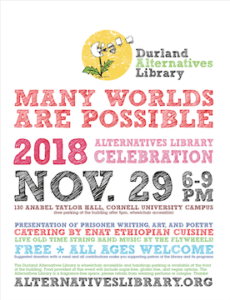 Click here to read about the upcoming celebration Many Worlds Are Possible and RSVP for yourself and your friends. The catering order goes in this week! P.S.S. Today at the library a patron was reading a book about forming habits, which is what prompted this email. Experts on healthy habit development advise that you start with what you already do, and then attach the new, desired habit to this existing positive behavior. This is called anchoring. For me, it’s about letting go of shame and seeing the change we want to make as simply a design challenge. Let’s do this!